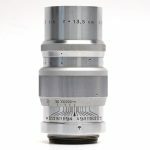 A very versatile lens, with which the picture area can be filled from an even greater working distance than with the 90mm lens. Its special value is in sports photography, in recording fine detail in architecture, and in photographing people and animanls from a distance unobserved. Distance is brought near, and foreshortened perspective can give surprising pictorial effects.